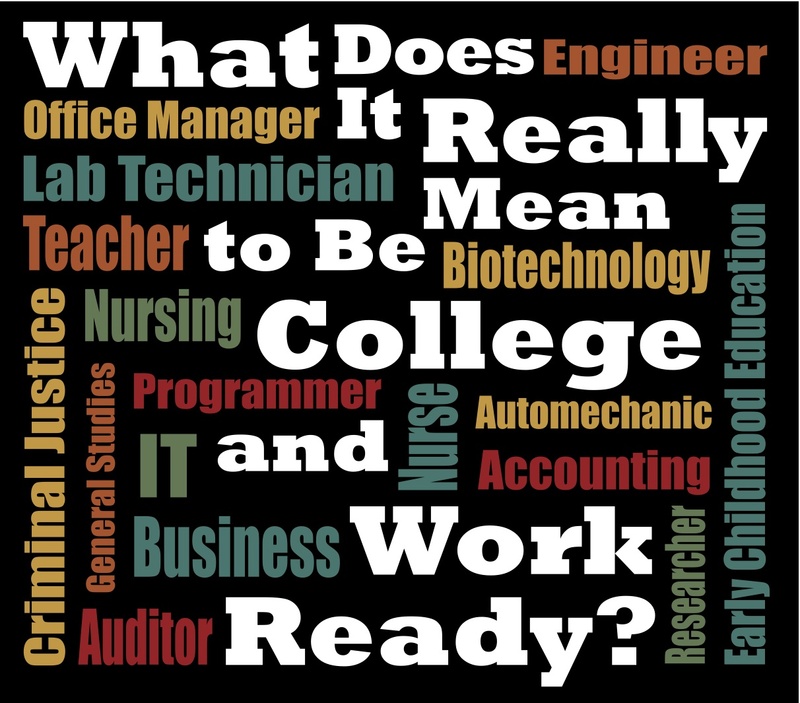 Educators are familiar with the phrase “college and career ready” but few are able to articulate what determines this readiness. This is because there has been little empirical analysis on the literary skills required in community colleges. Being college and career ready means students are able to communicate clearly—to speak grammatically, write well and read the required materials with understanding. 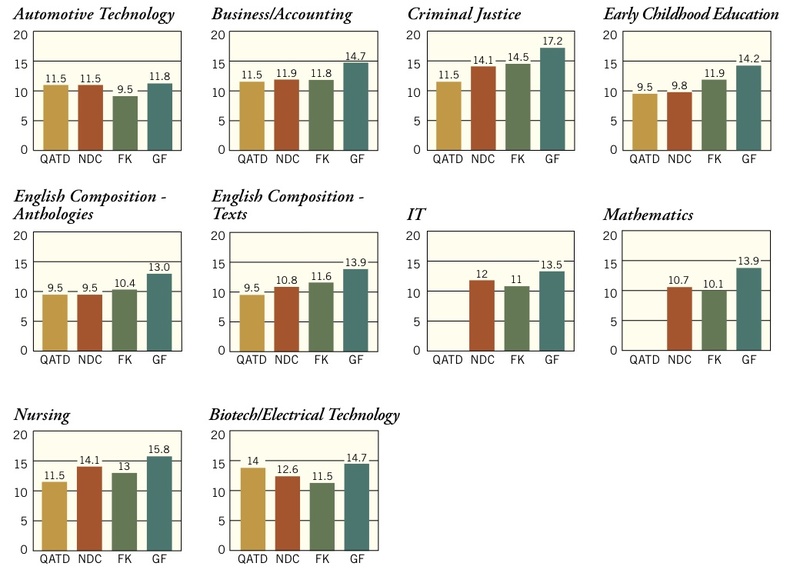 A May 2013 study from the National Center on Education and the Economy asked what kind and level of literacy is required of a high school graduate for success in the first year of a community college program? They collected data from seven community colleges in seven states, serving rural, urban and suburban populations with enrollments from 3,000 to 30,000. The reading and writing required of students in community colleges is not very complex or cognitively demanding. The reading complexity of college texts is between 11th and 12th grade. Successful readers of information-rich texts should have the ability to read complex texts in unsupported environments. The capacity to process, retain and synthesize large amounts of new information must be increased. Significant reading experiences must occur in a wider range of content areas. The skills in comprehending statistical tables, charts, maps, lists and other documents in college texts need to be improved. Reading for in-depth subject matter comprehension is not formally taught in our high schools. This disconnect between high school and college reading demands suggests a need to reexamine what is taught in high school. What are we asking our students to do with what they read? College students are rarely asked to do complex analyses of texts, except in English Comp classes. One third (33%) of the courses examined used multiple choice or true/false exams and assignments exclusively. Most introductory college classes demand very little writing; when it is required, instructors have very low expectations. Community College writing typically takes the form of informational writing or collecting evidence for a course of action. Complex writing plays a minor role in community college student exams. Even so, a large number of high school graduates cannot meet the low expectations that community colleges have of them. Community College instructors do not expect their students to read at the level of their texts or to write much. The majority of essays were argument or informational, only one college contributed narrative essays. 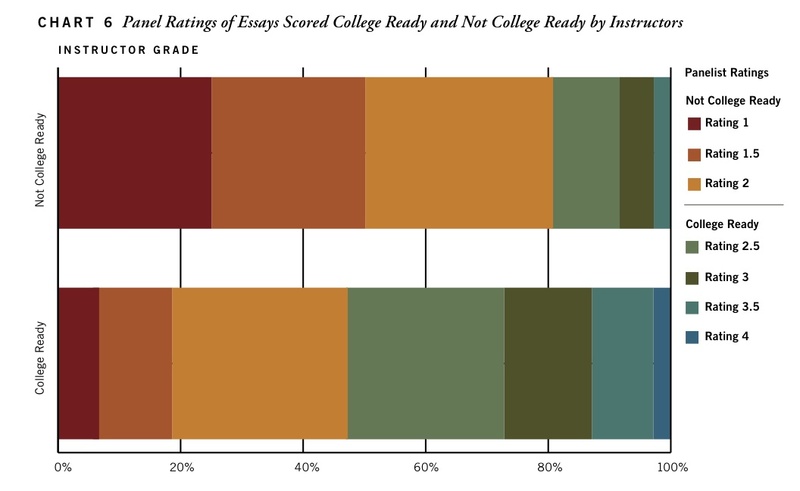 Agreement between scores was significant at the lower end of the grading scale with notable disagreement at the mid-range of the scale One-fifth (20%) of essays that the panel considered college ready were scored not college ready by the instructors. 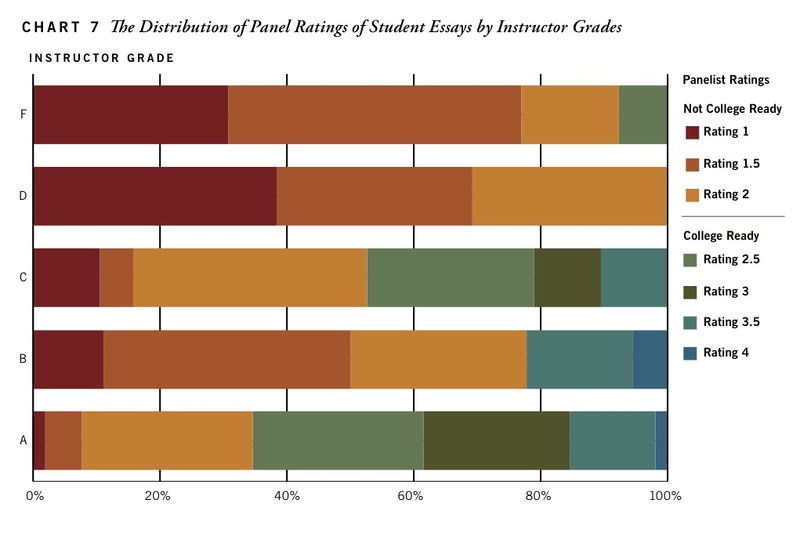 Almost half (48%) of essays considered college ready by the instructors were given scores of 2 or below by the panel. Over 75% of the essays given a B by the instructors were marked 2 or below by the panel. Argument essays often received Bs without including well-supported claims. No pattern emerged to suggest why the panelists graded the writing aspect of the subject matter essays more harshly than instructors. Community College students are required to learn college writing in English Comp and then rarely asked to write again. When they are asked to write outside of English class, the acceptable standard is considerably lower. Many of the deficits of HS school ELA instruction are being replicated rather than remedied in community colleges. Students clearly need better instruction in constructing arguments and in laying out their thinking logically and persuasively. We need high schools and community colleges to concurrently raise their standards for reading and writing. This doesn’t just happen in high school, but needs to be a collaborative effort when implementing Common Core State Standards throughout the PK-12 curriculum. Students must have the ability to read information-rich texts in unsupported environments. Teachers must increase the capacity of students to process, retain and synthesize large amounts of new information. Students must have significant reading experience in a wider range of content areas. Teachers must increase the ability of students in reading and understanding tables, charts, maps, and lists that supplement the prose in many college texts. We are not teaching our high school and community college students to be proficient writers. The limited writing skills that we do teach, we do so ineffectively. Many high school graduates cannot meet the literacy demands of community college programs. Complex writing tasks need to play a larger role in both high school and community college student exams. History teachers may increase their writing instruction skills by signing up for this free online class. The Common Core’s addition of narrative writing is likely to challenge many History/Social Science teachers that are unfamiliar with this type of writing. Students are now expected to write narratives that develop real or imagined experiences, and/or events using well-chosen details and well-structured event sequences. 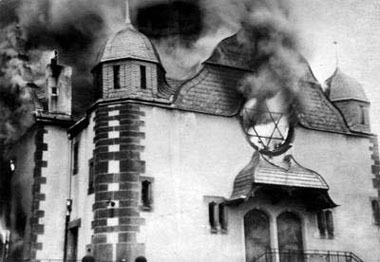 Since only six percent of my class or eleven out of my 183 high school students chose to write a historical narrative on our last formative assessment, I created a task that would increase their storytelling abilities about the principles of Judaism. Instead of outlining, I asked them to cluster or bubble map the main ideas from the textbook chapter. We use the 2007 California edition of World History: The Modern World (pp. 28-32) by Pearson Prentice Hall. Most students had one to two pages of events and people that they could use to create their narrative. Prior to beginning their writing, they also had a full day of instruction on period-specific vocabulary. 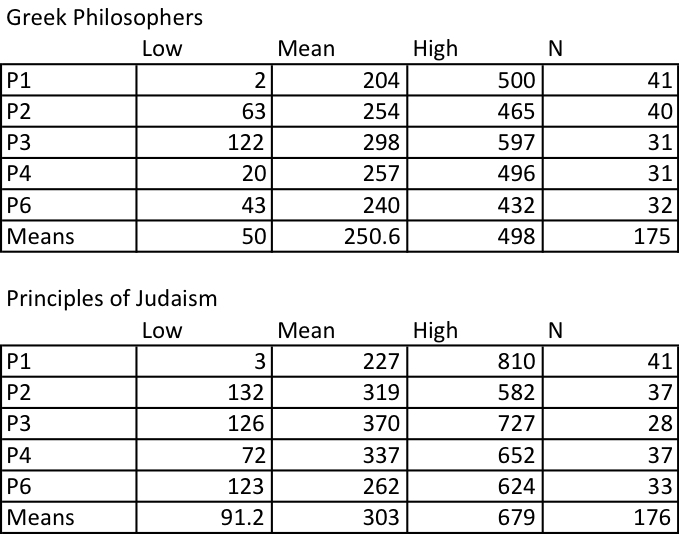 For homework the students also viewed the Crash Course video series segment on Judaism. Lastly, students viewed a short, online video on narrative writing tips and techniques. The video was played once in class and posted online so students could view it again from home. You have a 53 minute class period to write a Historical narrative about the Jewish people. Use your cluster map to provide details. 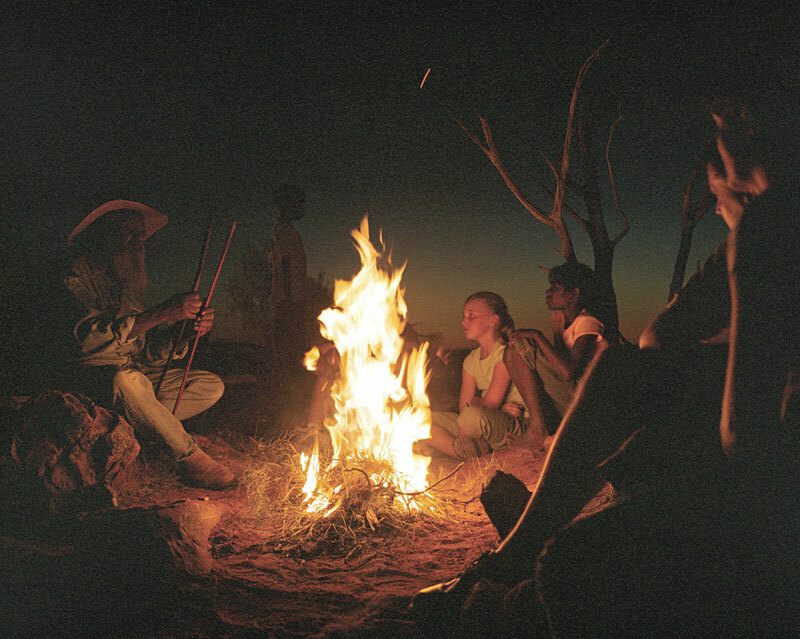 This task requires you to tell a story about a historical time period, blending facts with imagined characters and situations. Describe people who actually lived and events that actually happened. However, you may include fictional people and details. I use word count as a proxy for student effort and as a goal-setting strategy. Thus, I always like to display the number of words each class period writes. I then compare each class mean. I try to generate some competition between the classes. Why do you think period three wrote almost 150 more words than period 1? 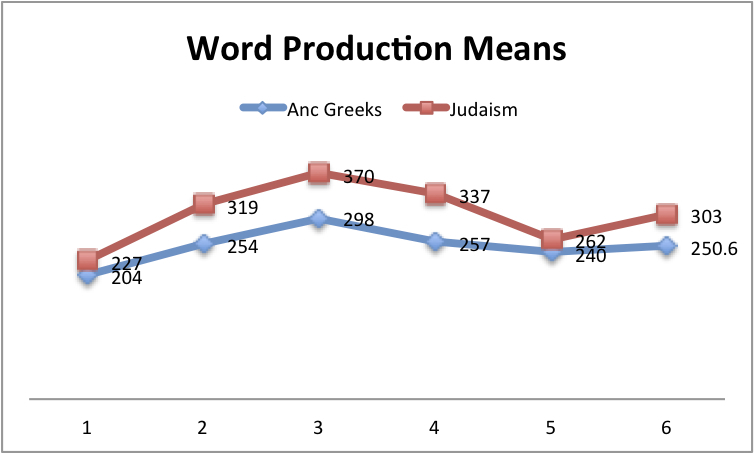 The chart above compares the average number of words written by each of my five classes. Number 6 is the average of all five means. A total of 176 essays were turned in. The factors I looked for in these narratives were: 1) a creative title; 2) word count; 3) main character point of view. During my readings, I discovered that a small group of students had misunderstood the assignment and had made their historical characters into outlandish fictional people doing things that had no relevance to the historical period. In my debrief with the students, I will remind them that the purpose of the assignment was to show an accurate understanding of historic events and details of actual places. The majority of my students picked a historical character and remained in that character for their entire writing assignment. One or two students misunderstood the assignment and wrote one or two paragraphs from the perspective of each Moses, Abraham, David, and Solomon. I attributed this to students not listening carefully enough to the directions. The charts below compare student performance on my last two writing tasks. This post is the third in a series on how to assign student writing and provide feedback without infringing on instructional time. In my flipped classroom, I am able to put content lectures online and spend class time conferencing with my students on improving their writing. These samples are introductory paragraphs to informative and explanatory and historical narrative prompts I assigned students on the ancient Greek philosophers. Write an informative/explanatory essay about the lives of the big three Ancient Greek philosophers, Socrates, Plato, and Aristotle. Include biographical facts as well as the contributions each philosopher made to Western political thought. Socrates, Plato, and Aristotle were three great philosophers. All three of them were connected in some sort of way. There lives were very different in many ways. The three subjects I will talk about are Aristotle, Plato’s and Socartes. They are all greek philosophers. Aristotles, plato’s and Socartes are all very similar. They all play a part of the economic structure and culture like laws and citizenship. One of these famous philosophers name was Socretes. He was a stone mason and philosopher. All the things we know about him comes from Plato. Plato was Socrates’s famous student. Socretes was also known for asking questions around Athens. But, the people of Athens got fed up and put him on trial when he was 70 years old. 280 people voted Socrates guilty and sentenced him to death. Socrates thought they should be paying him. But, unfortunately he died by drinking poison. Write a historical narrative retelling the Suicide of Socrates from one character’s point of view (Socrates, Apollodorus, or Crito). Tell the story of why Socrates was put on trial, what happened at the trial, and what happened at the end of the trial. When Socrates was 70 years old, he was put on trial. He was accused of corrupting the city’s youth and failing to respect the gods. 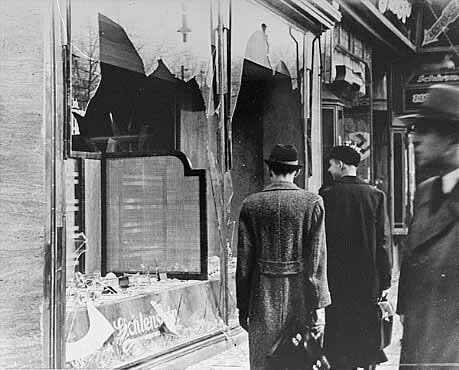 In the jury there was 501 citizens. The jurors condemned him to death. I am Socrates, I was an Athenian stonemason and philosopher. Most of what people know about me comes from my most famous student Plato. I didn’t write any books instead. I went to the marketplace and questioned citizens about their beliefs. I often ask the question “What is the greatest good?” To me this exam of questions was a way to help others seek truth and self knowledge, but to Athenians such questions threatened accepted traditions. The year was 399, I had to stand in front of 500 of my fellow Athenians. I was trialed for supposedly “corrupting the youth.” How outrages! All I did was spread my thoughts and teachings! Anyways, I knew, if I were to be guilty, I might be given the death penalty. The trial took place in the heart of Athens. Many people knew who I was. I am 70 years old. I had many anti-democratic points of view, that might have brought me here. As I conference with each student, I will employ rubrics from the Literacy Design Collaborative that evaluate argumentative, informative, and narrative writing. Students will assess themselves first, before I comment on their work. Adhering to Mike Schmoker’s advice from Write More, Grade Less – I will only provide feedback on improving introductory paragraphs and will ask them to revise and complete this assignment.